Access Sky Movies live and on demand with Sky Movies Month Pass. 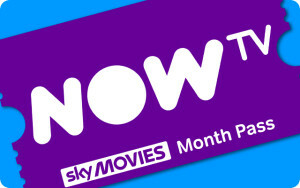 At end of the prepaid offer period, Sky Movies Month Pass automatically renews unless cancelled. See nowtv.com for current pricing. Remainder of the pass lost if cancelled during prepaid period. (Live channels not available on YouView.) NOW TV account required required. UK only. 18+. Valid debit of credit card required to set up NOW TV account. Content streamed with broadband/3G (charges may apply) to compatible device. See nowtv.com for list of compatible devices. Voucher must be redeemed within 1 year of purchase otherwise void. Give someone the gift of the biggest and best movies through NOW TV. With the NOW TV Sky Movies Pass you have unlimited access to over 1000 movies including the latest blockbusters and hundreds of classics on demand. Plus 11 Sky Movies channels and up to 16 premieres every month, there is something for everyone.Best of all, there is no contract. 1. Visit nowtv.com/movies 2. If new to NOW TV, select ‘Start 30 day free trial’ and create an account. Enter your code at the payment step to get your trial plus your free pass. 3. Existing users, go to ‘My Account’ to apply your code.